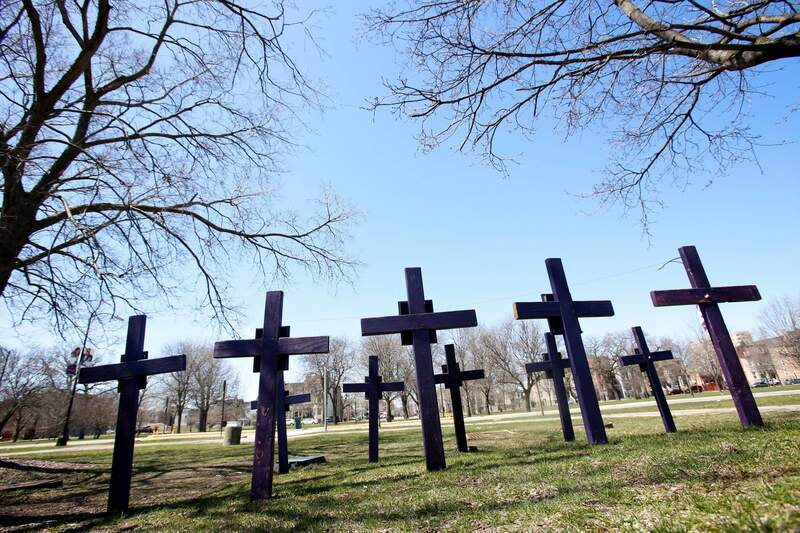 Crosses representing victims of gun violence stand outside Collins Academy High School in Chicago’s North Lawndale neighborhood. With frustration mounting over lawmakers’ inaction on gun control, the American Medical Association on Tuesday, pressed for a ban on assault weapons and came out against arming teachers as way to fight what it calls a public health crisis. CHICAGO – With frustration mounting over lawmakers’ inaction on gun control, the American Medical Association on Tuesday pressed for a ban on assault weapons and came out against arming teachers as a way to fight what it calls a public health crisis. At its annual policymaking meeting, the nation’s largest physicians group bowed to unprecedented demands from doctor-members to take a stronger stand on gun violence – a problem the organizations says is as menacing as a lethal infectious disease. Support any bans on the purchase or possession of guns and ammunition by people under 21.Back laws that would require licensing and safety courses for gun owners and registration of all firearms.Press for legislation that would allow relatives of suicidal people or those who have threatened imminent violence to seek court-ordered removal of guns from the home.Encourage better training for physicians in how to recognize patients at risk for suicide.Push to eliminate loopholes in laws preventing the purchase or possession of guns by people found guilty of domestic violence, including expanding such measures to cover convicted stalkers.Many AMA members are gun owners or supporters, including a doctor from Montana who told delegates of learning to shoot at a firing range in the basement of her middle school as part of gym class. But support for banning assault weapons was overwhelming, with the measure adopted in a 446-99 vote.